The 24.6 metre classic motor yacht La Bimba is sold, with Mike Horsley at Edmiston & Company representing both buyer and seller in the transaction. La Bimba was designed by Scottish naval architect GL Watson and launched in 1962 by Ailsa Shipbuilding in Troon, Scotland, to Lloyds class, designed to cruise the oceans. She was originally named Themara and then Morning Watch and later Atlantis of the Seven Seas, under which name she circumnavigated the world in 1988. Her owner put her into a yard in Genoa, Italy in 2008 in order to complete a total refit. Her original twin 174hp Gardner engines were totally overhauled, new teak decks were installed along with new generators, new shafts, the original propellers were overhauled and she received a new hydraulic anchor windlass, new air conditioning, a new hydraulic bowthruster and much more. 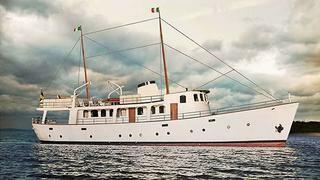 La Bimba is now lying in Italy where considerable money has already been spent as part of a new comprehensive refit. With much cosmetic work still to be completed she represents a unique opportunity for the new owner to complete the refit to his own particular requirements. La Bimba was asking €450,000.